It all began over sixty years ago in the Canadian cowboy town of Calgary. Roland & Undine Kiemle had met and married in this Wild West town and used every free weekend exploring the nearby Rocky Mountains. In summertime, they stayed in a tent and during winter they made use of the then deserted ski cabins in Sunshine Valley and Banff. Over time, their excursions extended further and further into the wilderness. During the fifties, they drove a test vehicle from NSU Motorenwerke on the original Alaska Highway all the way to Fairbanks and on to the highest mountain in North America, Mt. McKinley. Following this were excursions south to California’s Death Valley and further on into Mexico. Many weekends were spent hiking, fishing and hunting, as well as panning for gold and watching bears in the North American Cordillera mountain range. Soon they had two sons to share their adventures. Allan was born in Calgary and then Gary in Vancouver. A lifelong love of the outdoors and adventures had begun for them. Many years later, due to health problems, the family was forced to move back to Germany. Who knows, perhaps it was a twist of fate, but the return to good old Europe and to the developing Federal Republic of Germany also brought forth the birth of our later business – or perhaps our life’s work is more appropriate – which is to broker incomparable and unheard of experiences in nature. The Canadian Tourism Authority knew that the image of Canada that was presented to the world in the 60s was appealing only to a certain sector of tourists. They were aware of the bleak culture of Canadian cities which were for the most part, not appealing to international tourists. They had an inkling that there was more to be offered but for the most part the officials in Government offices in Ottawa had no idea how to change that image. They were mostly armchair adventurers – reading about encounters with bears and gold panning from the pages of Jack London and Robert Service. The Canadian Tourist Authority began seeking travellers from other countries who made trips into the Canadian wilderness. They had noticed that Germans spent very little time in the „normal“ tourist spots and headed for the far-away and not so accessible regions. Roland heard of their request for experienced wilderness travellers, and met with them. Our idea was to convince them that advertising a „Wild and Exciting Canada“ would bring many more tourists from all over the world. We of course had photographs and contemporary stories that showed a vibrant, compelling picture of Canada – the great untouched wilderness where adventures awaited the world to enjoy, and we had experience. Whether they used RV’s, or rented vehicles and tents, or simply slept out under the Northern Lights – we knew how to organize and accompany them on these journeys. Our slogan was: In Canada, freedom is not sold out! Our proposal was to replace advertising slogans in those days such as „Honeymoon at Niagra Falls“ and „East -West City Tours“ with „Visit Canada – a land of endless wilderness and unimaginable adventures“. We knew there was a vast market there for those hungry for adventure – and the world was hungry. Roland gave up his position as an mechanical engineer for Caterpillar tractors and together with his family established their own company that back then dealt with active-travel in Canada. In the Sixties, „The Northwest Voyageurs“ was still the only company organizing adventure tours to Canada. Thanks to our customers, we realized how badly informed they were on proper equipment. Participants had brought along sleeping bags suitable for spending a night during the summer at Lake Garda, Italy, but definitely not for the cold nights of the Canadian North. Gary’s encounter with Ulrich Dausien, a seasoned scout, resulted in a successful collaboration and the idea for the first few equipment outlet stores. Ulrich was continuously exposed to the harshness of nature having only a “confederate” Ju-jacket, a uniformed but non-functional piece of clothing worn by almost everyone in the outdoors at that timel. The initial practical pieces of clothing for the “outdoors” were designed and together with Gary, the first equipment outlet store was opened on Poststrasse in Heidelberg under the name SINE. SINE, Dausien’s scout name, didn’t take long to become a success. They had to move to larger premises and changed the name to Adventure Company. More outlet stores opened in Heidelberg, Mannheim, Freiburg and Heilbronn. At the same time, they were looking for a suitable name for the ever-growing equipment line. Our passion, as well as Ulrich’s, is Northern Canada, so of course it was impossible to ignore a great American adventurer and writer such as Jack London. Considering Jack London’s scout name on his steamer journeys on the Pacific Express was “Wolfskin”, this name was supposed to be used for future products; however, the authorities would not permit it. So, a supplementary name was needed and only Jack London’s first name was added – thus, one of the most successful “designer labels” in the outdoor industry was born: Jack Wolfskin! Gary opened the first Jack Wolfskin Store in Europe. At first in Heidelberg and shortly afterwards a second one opened in Freiburg. Roland had brought adventure tourism in Germany to life. In the meantime, Undine, Allan and Gary were already successfully busy on all continents with so-called active or adventure travels. The cigarette and tobacco company Philip Morris saw these enterprises as an opportunity to introduce their slogan “freedom and adventure”! A promotional concept was created together with another partner, resulting in one of the most successful advertising campaigns of a global company for almost 25 years: The “Marlboro – Adventure Team” was born. Since 1983, annual Marlboro adventure events were held. In the end, more than 30 countries participated. The number of applicants averaged 450,000 submissions. Since the company operated globally, “Northwest Voyageurs” was renamed as Adventure Tours due to the fact that the first name focused more on Canadian activities. Next, logistics had to be worked out for film productions in the United States. Commercials were shot in Utah and Arizona by directors Tony Scott (Top Gun, Beverly Hills Cop 2, Days of Thunder with Tom Cruise) and Tony’s brother, Riddley Scott (Thelma & Louise, Gladiator). By then, a whole new branch added itself to the already existing services for tourists. Together with Elmar Engel, another expert on Canada, Roland published several travel books as well as manuals for adventure seekers and outdoor enthusiasts. 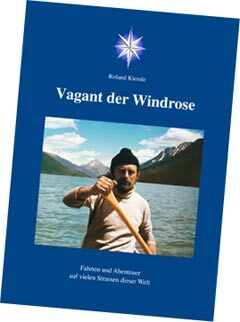 Also, a biography: “Vagant der Windrose” (Vagrant of the Windrose), a story about a family of outdoor experts, available at Adventure Company. Too soon, in 2001, Undine died of a long-lasting incurable illness. In 2009, Allan, the eldest son, after a long illness. In the meantime, Roland has gave up his career fulltime, but he still constantly travels between Yukon, Alaska, and the southern part of Africa. Even today, extraordinary travel is still on the agenda with selective friends. Nowadays, Gary is the driving force behind the family and he continues to add activities to the large spectrum of many years of successful ventures by implementing them through new ideas. At the age of 15, he led a group of expectant canoeists 850 km down the Yukon River, a demanding trip that doesn’t allow for mistakes. He had to be responsible for about a dozen adults, as well cook, scout, and be the uplifting guide for them, a job that influences a person’s character for the rest of his life. This first excursion through northern Canada was followed by a wide-range of activities on all navigable rivers in the Yukon Territory and British Columbia. Especially noteworthy was a sea kayaking expedition through the whale infested waters close to the Haida Gwaii Islands in the Pacific and through the canoe Shangri-La – the Bowron Lakes region in the Cariboo highlands. Gary and his brother Allan play a large part in the family business’s success. The two of them combined their adventures into a solid team and their experiences match the “spirit” of our company. Then, another member of the immediate family, Jörg Frölich, joined our team. The son of Roland’s sister had already worked for Gary’s company back when he was a student and had accompanied Allan on the long journeys through western Canada. Years later, Roland appointed Jörg a member of the “Marlboro Adventure Team” in order to gain valuable experience over the years in the southwestern United States. Today, Jörg Frölich follows in Roland’s, Gary’s, Allan’s footsteps and he’s an outstanding expert on North America and has his own company in Bietigheim-Bissingen, Germany. Years ago, together with “Travel Expert Tourism”, a travel agency was founded specializing in North American travel offering almost all types of travel services for Canada and the United States. Now, several hundred customers annually receive advice, make bookings and are taken care of. Jörg places great importance on proper and sound advice, which is why he still travels every year to the two aforementioned areas. Now, after nearly 30 years of extensive travels as well as more than 80 transatlantic flights, the “Canadian Tourism Commission” has awarded Jörg Frölich the highest seal of quality, “Canada Specialist Select”. Not to mention that the “Visit USA Committee” has made him a certified USA specialist. Gary Kiemle looks back on a life of nearly forty years as an entrepreneur, manager, guide and organizer. And for Roland, after more than 60 years of traveling many streets throughout the world, it is time to take it a little easier. The future of the activities we started many years ago is in good hands. Furthermore Adventure Company provides Canadian firms access to the European market. Through advertising and PR services, we help our Canadian clients to present themselves in Europe. „Die Abenteuerlust hat den Autor Roland Kiemle – Jungenschaftler in den 40er und 50er Jahren – seit der ersten Großfahrt in den Orient nicht mehr losgelassen. Mit Witz und Selbstkritik erzählt er von seinen Erlebnissen in der kanadischen Wildnis, dem australischen Outback, von Flussfahrten im peruanischen Urwald und Bergtouren im Himalaya.